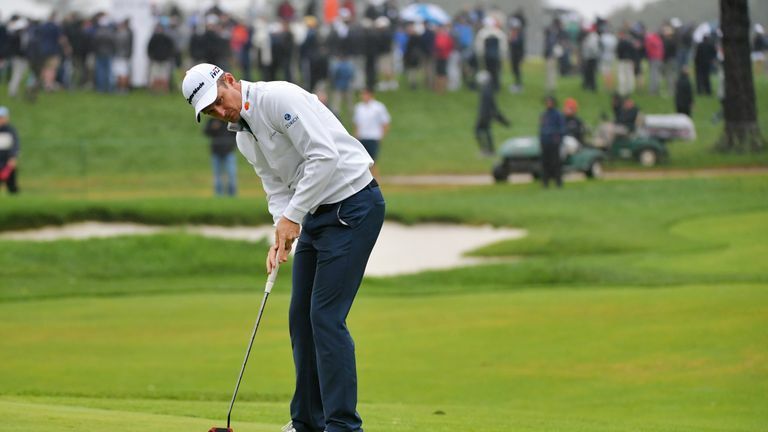 Justin Rose insisted he would not let his play-off defeat at the BMW Championship take the gloss off becoming world No 1 for the first time in his career. Rose was determined to dethrone Dustin Johnson at the summit of the world rankings with a victory at Aronimink, while a win would have set another landmark as the most successful Englishman on the PGA Tour. But he remains tied with Sir Nick Faldo with nine titles each as he was unable to match Keegan Bradley's par on the first play-off hole after both finished a shot clear of the field on 20 under par following the rain-delayed final round on Monday. The Ryder Cup star had one hand on the title when he birdied 16 and 17 to keep pace with Bradley, and Rose needed only a par at the last for victory when the American pushed his second into the grandstand and failed to get up-and-down. However, Rose's approach stalled in the wind and landed short of the green, and his mis-judged pitch stopped 15 feet from the hole before his par-putt caught a big piece of the hole but stayed out. A few minutes later, Bradley was tapping in for par and his first PGA Tour win for over six years after Rose missed the target from six feet, but the 38-year-old remained focused on the magnitude of his achievement at earning the world No 1 berth rather than dwell on his near-miss. "To get to world No 1 is unbelievable, and I can say now in my career I've been the best player in the world," said Rose afterwards. "I've been to the top of the game, and that's definitely some consolation. "I just wish I could have enjoyed the moment maybe, and this just slightly dampens it. But tomorrow or the next day, or the week after, I'll look back at this and think it was amazing, an amazing moment in my career. "I'm disappointed right now. To bogey the 72nd hole and to get into a play-off is obviously nothing to be happy about, but the putt I had to win was the best putt I've ever hit to try and win a tournament. I thought that thing was in the middle, but it wasn't to be. "But obviously it's a big consolation being world No 1. That's something that I will look back on this week and think it was an incredible achievement. I'd have loved to have got there by winning, but today was fun." Rose's journey to the top of the world rankings was a 20-year process having turned professional shortly after his memorable finish at The Open in 1998, and he insisted he still has the desire to keep improving and winning. "It's boyhood dreams," Rose added. "It's a dream that we've all thought about at some point in our lives or as young aspiring golfers thinking about it. "I turned pro at 18 and it took me 20 odd years to get to world No 1, but my advice would be to just dedicate yourself to improving, to learning, to trying to get better. That's what excites me, but the quest to get better is why I wake up in the morning." Rose's runner-up finish ensured he would arrive at next week's season-ending Tour Championship in second place in the FedExCup standings, and he is relishing the challenge of attempting to overhaul Bryson DeChambeau and land a $10m bonus as FedExCup champion at East Lake in Atlanta. "No 2 is an incredible spot to be in, and it's a week where there are many scenarios in play," he said. "When you go in there 15th, 16th or 17th, you know you have to win, and then you have to hope for a ton of other things to happen. "But obviously when you're No 2 and you win, then you win. I'd hate to round off the season with three seconds, but that could be good enough next week, you just never know."